Fast thinking can help to generate the pieces of the jigsaw. 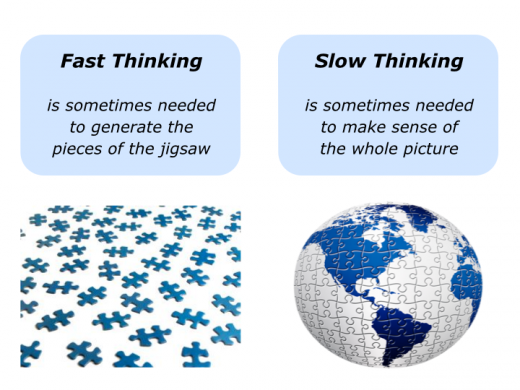 But slow thinking may be needed to make sense of the whole picture. 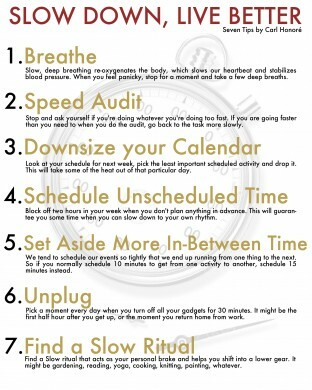 Carl Honoré popularised many of these ideas with his book In Praise of Slow. 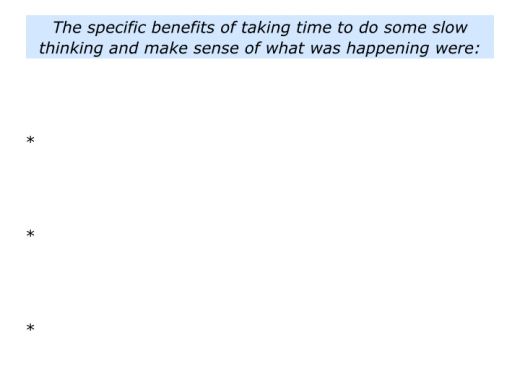 In the United States this was called In Praise of Slowness. He is not against speed. In fact, Carl believes some things need to go even faster. Many of our epiphanies, however, come from slow thinking. Nurturing this approach can enable us to appreciate life, see things in perspective and sometimes make breakthroughs. It can bring benefits in both our personal and professional lives. Here is one of the first videos featuring Carl talking about the importance of cultivating slowness. You can discover more about his work on his website. Looking back at your own life, when have you been able to do some slow thinking? How did you make this happen? You may have been able to grab a few minutes during a crowded schedule, set aside a day or even create a longer time to gain a sense of perspective. 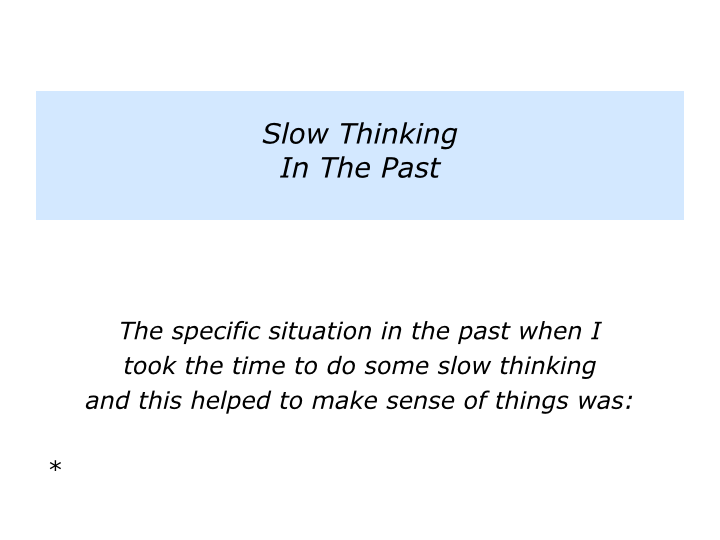 Describe a specific situation when you took the time to do some slow thinking and make sense of what was happening. 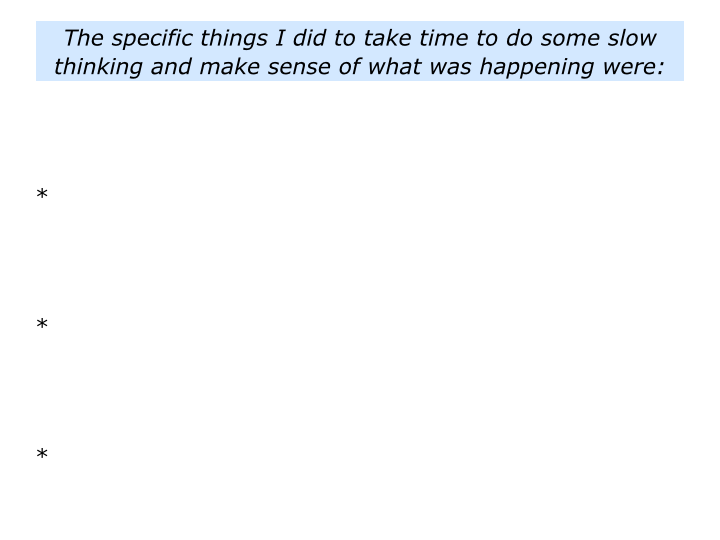 Describe the specific things you did to take the time to do some slow thinking and make sense of things. Describe the specific benefits of taking those steps. 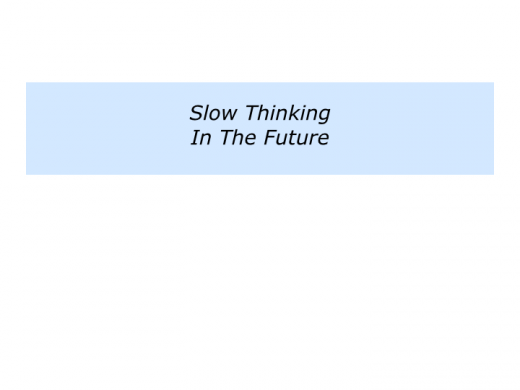 Looking ahead, would you like to create some time for slow thinking? This can be is challenging, especially in the business world of back-to-back meetings. 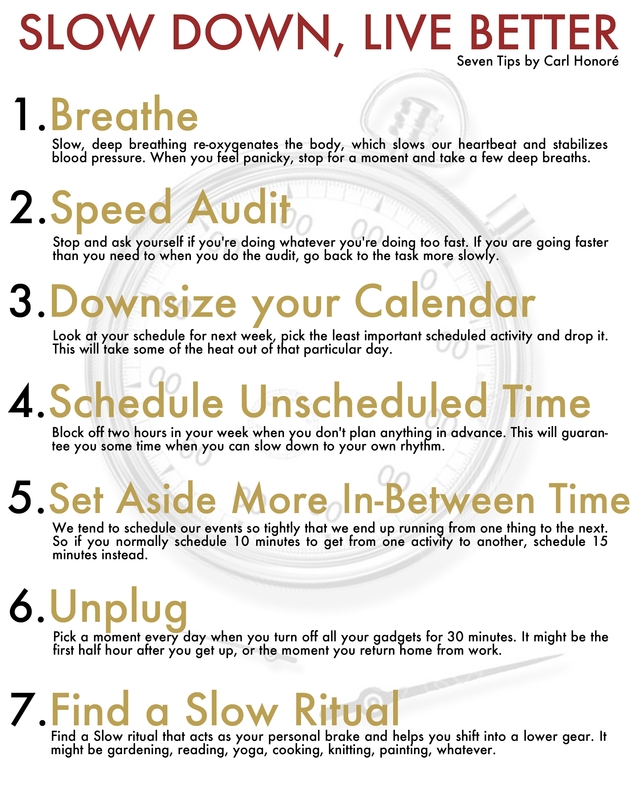 To schedule time to relax, recentre and rehearse what you are going to do before attending important meetings. To find a place where you can collect your thoughts – a sanctuary away from the crowded office – where you can think strategically and find creative solutions. To schedule times to go for a walk, get oxygen and stimulate your brain. 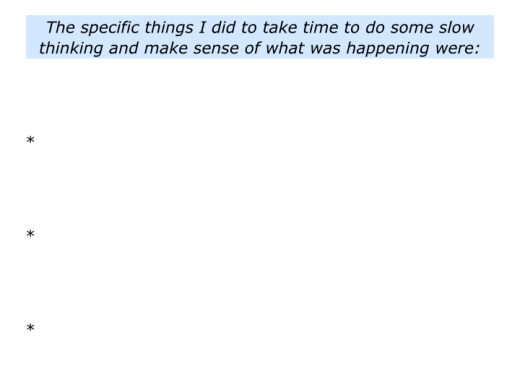 To schedule meetings for 45 minutes, rather than for 1 hour, to give time to reflect, rest and rehearse before the next session. Doing these things can help you to see things in perspective and make better decisions. 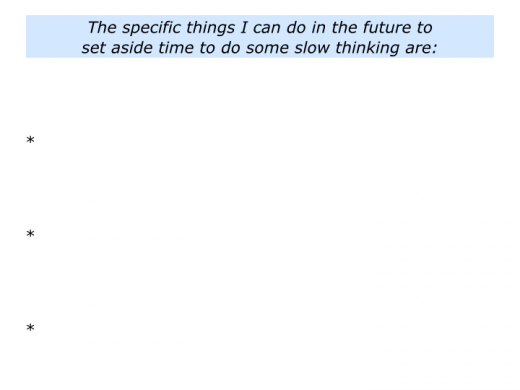 Carl provides some of the following tips in his book The Slow Fix. Good leaders often set aside time for their team to recentre. 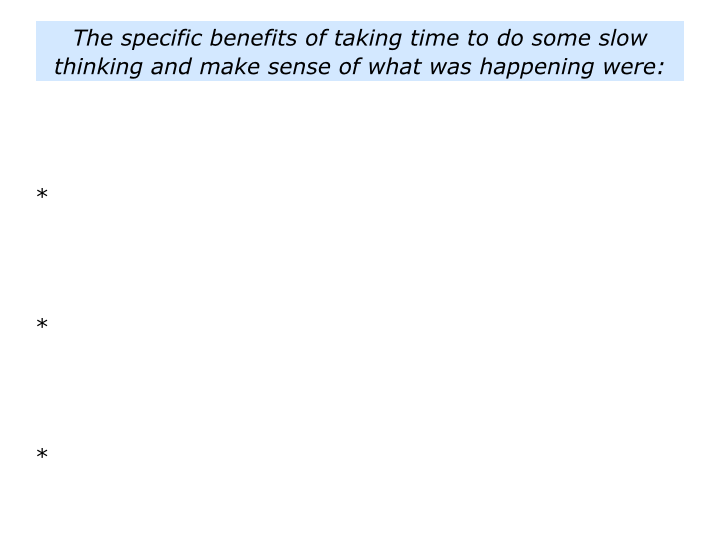 One team I worked with devoted three days a year to slow thinking. “But we haven’t got time for slow thinking,” somebody may say. Good leaders often say that the opposite is true. They believe that, when appropriate, it is important to make time to see things in perspective and make good decisions. The quality of these decisions will determine whether or not their teams achieve success. 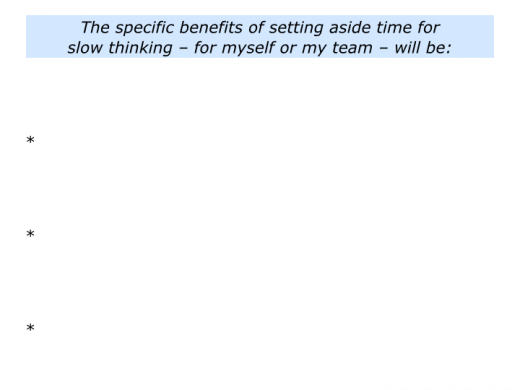 Describe the specific things you can do to set aside some time for yourself to do slow thinking. 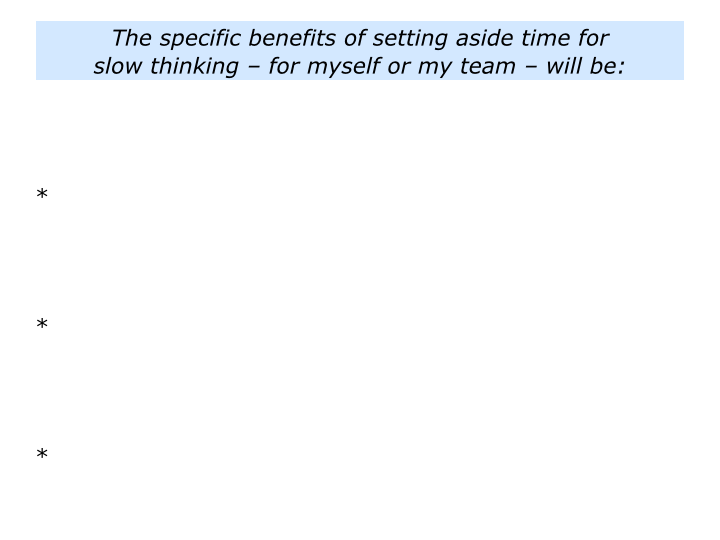 Describe the specific things you can do to, if appropriate, set aside some time for your team to do slow thinking. Describe the specific benefits of doing these things – both for yourself and your team.